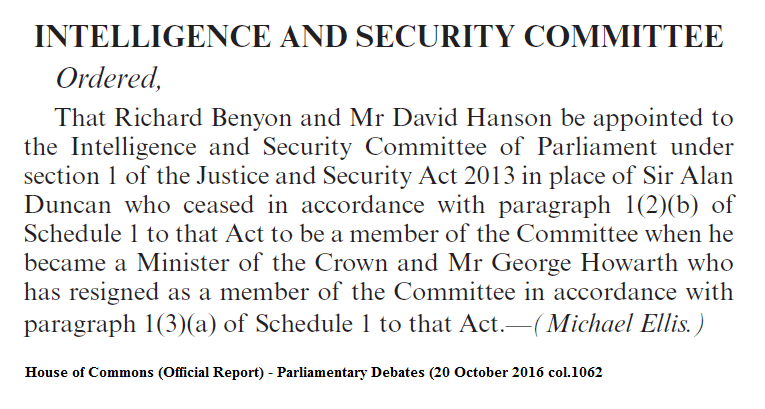 In previous posts, here , here and here, I’ve written about the process of appointing members of the Intelligence and Security Committee, and in particular about the new arrangements for appointments introduced by the Justice and Security Act, 2013. Although the ISC is reconstituted after each general election, there are occasional changes if members leave and need to be replaced. There were two new appointments to the Committee in October. These were prompted by the departures of Alan Duncan, who was appointed as a Foreign Office Minister in July, and George Howarth who stepped down from the ISC in October. Duncan left under that section of the Justice and Security Act which prevents Ministers from serving on the ISC. It is not, at present, clear why George Howarth has stepped down. Interestingly the appointment of a replacement for Alan Duncan was originally on the House of Commons order paper for 17th October, although it was not debated on that day, which suggests that Howarth’s decision was, perhaps, a recent one and it was decided to allow both new appointments to go through together. Alan Duncan has only been a member of the ISC since the general election. George Howarth, however, was the longest serving member of the current committee, having joined the ISC after the 2005 general election. His departure means that Lord Lothian (Michael Ancram), who replaced James Arbuthnot on the ISC in January 2006, is now the longest serving member. However, he is now the only current member to have served anywhere near two terms on the ISC, the next most experienced member, the Labour MP, Fiona Mactaggart, only joined the committee in January 2014. With only one member who served throughout the previous Parliament this is now the most inexperienced Intelligence and Security Committee since the first committee was appointed in 1994. As a result of this when the ISC has been reconstituted after each general election it has been comprised of a combination of new and existing members. Although this is perhaps more difficult when there has been a change of government, it was for precisely this reason that Labour retained Tom King as the Chair of the ISC, after it came to power in 1997. Labour also retained the services of three other original members of the committee. Several MPs have served for long periods on the committee, most notably Michael Mates (1994-2010) and Alan Beith (1994-2008), and have provided an important element of continuity when there has been a turnover of membership. Howarth and Ancram provided that on the current committee. The potential challenges facing a newly constituted ISC were thrown into sharp relief in 2005 when a new committee was appointed in July, only days before the 7/7 London bombings. Moreover, that committee was considerably less experienced than its predecessor having retained only two members from the previous Parliament and having appointed a new Chair. Members of the committee from that time observe that it was forced to hit the ground the running. Another potentially worrying tendency is an increased turnover in membership of the ISC. There was only one change of membership in each of the first two committee, 1994-1997 and 1997 – 2001, when Lord Howe stepped down from the first committee and Yvette Cooper left the second for Ministerial office. Membership of the third committee 2001 – 2005, remained the same throughout the Parliament. However, the fourth committee (2005 – 2010), had five changes of membership, including three Chairs. This was far from ideal and certainly impacted on the committee’s work and the wider perception of it. The committee appointed in 2010 was somewhat more stable that its predecessor, with only three members leaving during the Parliament, although the departure of its Chair, Malcolm Rifkind, towards the end of the Parliament was more than a little unsettling. Unlike Julian Lewis, who left the committee after him, Rifkind was not replaced and a new Chair was not appointed until after the general election. In addition to the retention of experienced members, another way in which the ISC has sought to provide expertise, in an area in which few parliamentarians have any experience, is through the appointment of members with some experience of dealing with the intelligence agencies. This has led to a tendency towards seniority in appointments to the ISC, with a large proportion members having formerly held Ministerial office, particularly in the Home Office, the Foreign Office, the North Ireland Office or the MoD. This has not always been a welcome approach to selecting ISC members as it has allowed the perception to develop, within Parliament and beyond, that the ISC is too close to those it is responsible for scrutinising. In interviews for our research, one parliamentarian who subsequently went on to serve on the ISC even suggested that because of his experience in working with the agencies he was precisely the kind of person who should not be selected to serve on the ISC. Although he did gracefully concede that he had changed that opinion when re-interviewed following his appointment to the committee. I have written elsewhere about the need to adopt a different approach, and that the government should perhaps throw the net a little wider, in nominating members for the ISC. However, the replacements for Duncan and Howarth, the Conservative MP, Richard Benyon and the Labour MP, David Hanson, fall pretty firmly into the standard profile of appointments to the ISC. Both have previously served as Ministers. Of the forty-six parliamentarians who have served on the ISC, Benyon and Hanson are the 26th and 27th former Ministers to be appointed to the committee. They are also the 35th and 36th men to serve on the ISC. David Hanson, in particular has extensive relevant Ministerial experience having served as Minister of State in the Northern Ireland Office, the Ministry of Justice and perhaps most significantly, as Minister for Security and Policing in the Home Office. If one were to draw up a list of MPs who are possible candidates for ISC membership, based solely on relevant Ministerial experience, David Hanson would appear quite near the top of that list. If there was some concern in Whitehall that Jeremy Corbyn would take this opportunity to nominate a well-known critic of the agencies to the ISC, they will have been allayed by Hanson’s nomination. Richard Benyon‘s, Ministerial experience is somewhat more modest and less relevant, having served as a Parliamentary Under-Secretary of State in DEFRA. His qualification for appointment to the ISC probably lies in the fact that he is a former officer in the British Army, with experience in Northern Ireland and East Asia. Benyon will also be the only member of the ISC who is not a Privy Counsellor, although that may follow. Although members are still nominated by the Prime Minister in consultation with opposition leaders, appointments to the ISC are now subject to parliamentary approval. Nevertheless, these two new appointments apparently went through on the nod with no opposition in the chamber. Whether either of these appointments are likely to provide anything new to the ISC or offer a more challenging or independent perspective on the work of the intelligence and security agencies or the government’s handling of intelligence remains to be seen, but I doubt it. This entry was posted in Uncategorized and tagged Intelligence and Security Committee, ISC Appointments. Bookmark the permalink.